Prince Harry and his fiancee, Meghan Markle, have embarked on their first official joint visit to Northern Ireland today. They kicked off a whirlwind day at Lisburn’s Eikon Exhibition Centre before making their way to Belfast where they called in at the Crown bar for lunch and went on walkabout in the city centre. Then it was off to Catalyst Inc before a visit to Titanic Belfast. 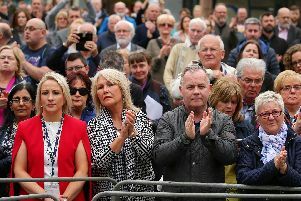 The couple, who are due to wed in May, began they day in Lisburn this morning, attending an event to mark the second year of the youth-led peace-building initiative Amazing the Space. Around 2,000 schoolchildren were there to greet the Prince and his American actress bride-to-be at the Eikon centre. Amazing the Space is a youth-led peace-building initiative, funded by the Northern Ireland Executive Office, that empowers young people across Northern Ireland to become ambassadors for peace within their communities. Prince Harry has been a key supporter of Amazing the Space, officially launching the 2018 project on his visit to Belfast in September. He and Ms Markle met young people involved in organising today’s event after watching a number of musical and dramatic performances by schoolchildren who will commit to live out peace pledges. The couple enjoyed lunch at the Crown Liquor Saloon, Belfast’s atmospheric Victorian gin palace which is filled with a wealth of architectural features and is a major tourist attraction. After dining they went on a walkabout outside the building to meet the people of Belfast. At the nearby campus of Northern Ireland’s next generation science park, Catalyst Inc, Ms Markle and Harry the met some of Ulster’s brightest young entrepreneurs and innovators. Their day ended with a tour of Titanic Belfast which tells the story of the famous ship, from her conception in Belfast in the early 1900s, through her construction and launch, to the vessel’s maiden voyage and infamous sinking.